The Stratford Shakespeare Festival current production of Shakespeare’s late play Cymbeline features outstanding performances from many of the principals, especially from Graham Abbey, who has returned to the Festival after an absence of seven years. Aside from some odd design choices, this is thoughtful production in which steadfastness and love endure much suffering but ultimately conquer malice and hatred. The play was a favourite in the Victorian period and the present production makes such a strong case for it that it deserves to become a favourite again. Cymbeline is one of Shakespeare’s late plays identified by Northrop Frye as “romances”, a category that includes Pericles, The Winter’s Tale, The Tempest and The Two Noble Kinsmen. In these Shakespeare returned to an earlier form of storytelling much like the fairy-tale that goes beyond tragedy and comedy to include the miraculous. The themes include reconciliation, the healing power of time and the nature of storytelling itself. Cymbeline is an excellent example since its plot allows Shakespeare to revisit elements of some of his best-known tragedies and to look at them from different perspective. Cymbeline, a legendary king of England living supposedly during the reign of Caesar Augustus (27 BC-AD 14), has had his two sons stolen from him not to be found. His one remaining child is Imogen, here called “Innogen” as per the 1986 Oxford Edition of Shakespeare which claims that the spelling “Imogen” arose as an error when the manuscripts were printed. Error or not, the character has been called “Imogen” for the past 400 years and it seems a tad pedantic to try to change it now that it has become a standard female given name. After all, would you start referring to Falstaff as “Oldcastle”, which was the character’s original name? Or for that matter would you change Cymbeline’s name to “Cunobelinus” died c. 40 ad), the name of the historical king on which Cymbeline is based? I don’t think so. In any case, Innogen, as we must call her now, has secretly married a commoner, Posthumus Leonatus, whom Cymbeline banishes from the kingdom. Posthumus goes to Rome, where he meets a cynical gentleman named Iachimo, who believes no woman can be faithful to her husband and claims he can go to England and come back with proof he has slept with Innogen. Meanwhile, Cymbeline’s second wife, Innogen’s evil stepmother, convinces Cymbeline not to pay tribute to Rome, thus bringing the two countries to war, and keeps urging her own son Cloten to woo Innogen as she plots to win the crown. Shakespeare is clearly revisiting plot elements from King Lear and Othello and, when Innogen dons male attire to escape the court, of Twelfth Night and As You Like It. All these elements combine to create the tale of a world riven in so many ways it seems impossible that the pieces can ever be put together and made right again. In the political sphere, England opposes Rome. In the domestic sphere, the Queen opposes Cymbeline and his daughter, Cymbeline opposes Posthumus and, after Iachimo’s false report, Posthumus opposes Innogen. What is so wonderful to watch is how carefully Shakespeare shows how the forces of evil in the play undo themselves and the divisive plots they set in motion have the unforeseen effect of causing the world to return to order. Cymbeline, perhaps more than the other Romances, portrays a self-healing world where suffering, though painful, ultimately leads to a greater understanding where mercy triumphs over revenge. As Posthumus tells Iachimo at the end, “The power that I have on you is, to spare you; The malice towards you to forgive you: live, And deal with others better”. Cymbeline may be the title character of the play, but the key roles are those of Innogen and Posthumus. In his years away, Graham Abbey’s abilities as an actor have grown phenomenally. He portrays Posthumus’ love for Innogen, his anger at her supposed betrayal, his grief at her presumed death and his longing for his own with a rawness and power that you’ve never seen before. It’s a performance full of heartbreak that should remind theatre-goers that Posthumus is one of the great roles in Shakespeare. Cara Ricketts is an ideal Innogen. She is no weak blossom but a young woman who has defied her parents and can barely control her anger that they still oppose her. The role encompasses both tragedy and comedy and Ricketts is equal to both. She has the full measure of Innogen’s rather rocky start in her male disguise and grief when she discovers what she believes is the slain Posthumus is deeply moving. The play is filled with numerous other fine performances. Brian Tree, who seems to have made a career of playing loyal servants, outdoes all his previous portrayals as Pisanio, a servant to the Queen who secretly transfers his loyalty to Innogen. The genuineness of his compassion for her plight at court, his painful hesitancy to reveal he’s been ordered to murder her and his ingenious plan to circumvent that commission are truly affecting. As the Queen, Yanna McIntosh revels in the chance to play someone purely evil. She has a knack for giving the sweetness she shows in public an acidic edge. As Cymbeline, Geraint Wyn Davies comes across first as an unjust, blustering old man toward Posthumus and Innogen, then as a tough negotiator with the Roman Caius Lucius (Nigel Bennett), then as a man overwhelmed by his previous folly and by the love that those he alienated still hold for him. Tom McCamus, who has played a number of dissolute characters lately, makes a fine Iachimo, a man compelled to destroy faith and virtue and the people who profess them simply because they contradict his own cynical philosophy. Mike Shara makes Cloten, the Queen’s son who she wishes Innogen to marry, a comically obnoxious idiot. The role can be made even funnier, but Cimolino seems worried that too much humour will upset the overall mood of seriousness he is trying to establish. Shakespeare, of course, had no such qualms about mingling comedy and tragedy. In smaller roles, Peter Hutt makes Doctor Cornelius’s longwinded explanation of his potions one of the most humorous parts of the final reconciliation scene. Nigel Bennet makes an imposing Roman Caius Lucius, who reveals a kind heart beneath his martial exterior. As Belarius, an exile from court living in the wilderness, John Vickery tones down his proclivity to overtheatricalize, while E.B. Smith and Ian Lake as his presumed sons Guiderius and Aviragus give enthusiastic if not quite subtle enough performances. As the Soothsayer, Ian D. Clark seems to have wandered in from a student production of a Greek tragedy. The main peculiarity of the production are Carolyn M. Smith’s costumes. The Queen, Innogen, Pisanio, Posthumus, Cloten, Cornelius and the members of the Italian court are all dressed in Elizabethan costume with slit sleeves, ruffs and heeled shoes. Cymbeline and the other English characters are clad in medieval garb. The Roman soldiers are in tunics, leather skirts and red-plumed centurion helmets. The Queen’s First Lady (Chick Reid) wears a modern black Martha Graham-style dance dress as if Smith has forgotten to costume her. How it is that the characters are dressed in differing period styles? The effect is not post-modern or Smith would have chosen a wider range of styles. It’s true that the people of Shakespeare’s time had little notion of historical costume and imagined that people of other times wore what they wore. But Smith is clearly not trying to achieve that effect either, so the point of her design remains a mystery. Cimolino has given the play a slow, deliberate pace that fits with his general earnest view of the subject matter. 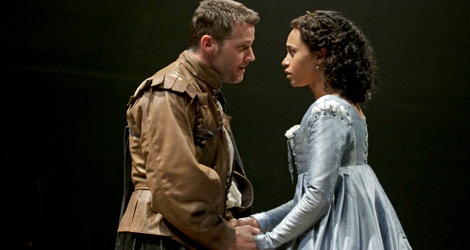 His aim is to show that Cymbeline is as moving a play as The Winter’s Tale and as magical in atmosphere as The Tempest. In those goals he succeeds admirably and you would have to have a hard heart not to be affected by the strong outpouring of emotion of the long final scene where mercy becomes the only moral response to human frailty. If you have never seen Cymbeline before, now is the time to do so since it comes around so seldom. If you already know the play, you’ll want to see this production since it so clearly reveals the power of this dramatic fairy-tale to move us. Photo: Graham Abbey and Cara Ricketts. ©2012 David Hou.